Huge Savings Item! Free Shipping Included! 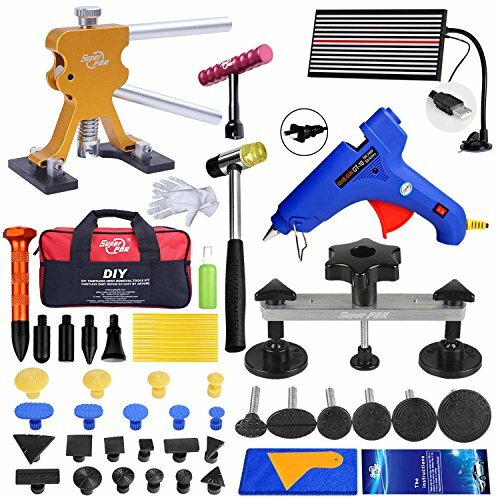 Save 11% on the Fly5D Upgraded 57Pcs Car Paintless Dent Removal Kit Adjustable Gold Dent Lifter Bridge Puller PDR Set Tools for Hail Damage Vehicle Dent Repair Door Dings Popper Refrigerator by Fly5D at Lazaranda Dallas. MPN: F5D-AM-PK16-KT. Hurry! Limited time offer. Offer valid only while supplies last. FLY5D will offer you the most complete and best quality car dent and ding repair kit for you to solve both small and large car body dent projects. FLY5D will offer you the most complete and best quality car dent and ding repair kit for you to solve both small and large car body dent projects. The Complete Guide to Auto Body Dent Repair equips you with all the information needed to return your car to its former glory. 1.clean dent surface,If the dent is very small you can barely see it, use a dent board to check where is the dent. 5.Let the glue cool for about 8 minutes. The cooling time should be less than 10 mins and should be shorter slightly in winter. 8.After fixing the dent,use alcohol to clean the extra glue on the car and the puller sets. Excellent Quality,Perfect Design,Premium repair effect, A must-get Dent remover kit for you ! ! !Click "Add to Cart" Now, While Supplies Last! UPGRADED GOLDEN DENT LIFTER - The feet of our upgraded golden dent puller are adjustable, you can adjust the fixed position and distance for your different size dents. (More scientific and convenient than before)one screw on the top of the dent lifter is used to adjust the middle height of hand lifter.Stainless steel material makes the lifter more sturdy and durable. SUPERIOR QUALITY&HIGH SAFETY:Every tool in the car dent puller kit is meticulously inspected and certified for Rockwell Hardness. Aluminum body,Stainless Steel the Handle and Adjustment knob makes the lifter more sturdy and durable.Our dent puller tool have a Soft Silicone Bottom,Baking-varnish-free dent repair can insure 100% protect the original paint. WIDE& EASY TO USE:FLY5D Dent removal kit can repair door ding and hail damages on the metal surface,such as auto,motorcycle,refrigerator,washing machine etc.The mini hot melt glue gun with glue sticks is not only for car dent removal, but also can be used in DIY home repair.Easy to control ,Even the girl can easily repair.a good helper for you.